At this time, Classic Coatings will no longer be offering ceramic coating services. Thank you for your past patronage. Classic Coatings Announces New Partners! Classic Coatings is starting 2016 on a little different note this year. For the past 15 years, Laura and I have owned 100% of Classic Coatings. As of January 1, 2016, we sold 21% of Classic Coatings to James Braun (7%), Jamie Hasenstein (7%), and Brett Markowski (7%). All three of these individuals have worked hard for many years and contributed greatly to make Classic Coatings what it is today. I am grateful to have them as business partners. These changes will not affect the day-to-day operations of the company. Our new partners will be integral in keeping operations at Classic Coatings running smoothly as we continue to grow. On April 13, 2016, Classic Coatings' Two Rivers plant was recognized at the Two Rivers Water & Light Energy Conference with an award for reduction in electricity usage. This plant location reduced their electrical usage by 31,300 kilowatt hours in 2015. 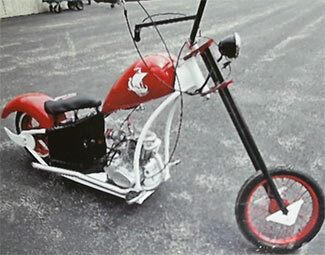 The Valders High School Mini-Chopper Team expressed gratitude to Classic Coatings for the in-kind donation, time and support provided to them for their high school project. In a letter from the 10-person student team, it says, "Completing the mini-chopper project would not have been possible without you. Through this program, we have bonded closer as a team and learned many new and prevalent skills. We had some issues from time to time throughout the school year as any group would, but we worked through it and gained better communication skills in the process." They added, "It was messy and time consuming but it was also pretty fun. There were lots of pictures taken and everyone was able to share a good laugh now and then. Thanks again for your support!" Mercury Marine's Supplier Integration Manager determined that Classic Coatings has met the requirements for graduation from the Supplier Integration Program. Graduation is based on several measures of quality improvement including SPR Quality score of 31 (out of 40) or better for three consecutive months, no line shutdowns or significant field issues for the past six months and successful closure of all SIM major strategic action items. Classic Coatings is very pleased to have been awarded this honor by Mercury Marine in December 2011. Only about 50 other Mercury Marine suppliers have ever received this award. Staff at Classic Coatings worked very hard to reach this goal. Our entire team has done a great job! An article entitled, "This Coater is Classic" appeared in the 2009 summer issue of Powder Coating Institute Magazine. This article detailed the need for Classic Coatings to open a second location in Two Rivers, Wisconsin in order to handle to high volume of powder coating demands. View flyer detailing Classic Coatings positive results using ITW Gema lightweight powder coating units with fluidizing hoppers. We have found at Classic Coatings that the Gema guns are much easier to operate than our previous guns. They are much lighter and deliver a higher quality finish. Also, it was very easy to train our employees to use them. Classic Coatings, Inc. Acquires Seal-Fab Corporation. 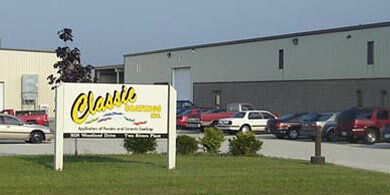 Classic Coatings has added to their capacity by acquiring Seal-Fab Corporation in Two Rivers on October 26, 2007. The 65,000 square foot state-of-the art Two Rivers facility will improve the geographical territory of Classic Coatings, Inc.,to better serve their customer base. The new plant, located 30 miles north of Sheboygan, has two powder coating lines and a dedicated parts washing line. Classic Coatings Recognized for "Going Green"
Classic Coatings always does what it can to reduce waste and be a good steward for our environment. We were awarded a Waste Reduction Certificate from ITU for reducing our towel waste in 2010. View certificate. Classic Coatings is a member of the Powder Coatings Institute. The Powder Coating Institute (PCI) is a non-profit organization that represents the North American powder coating industry. It promotes powder coating technology by communicating the benefits of powder coating to manufacturers, consumers, and government.